Made in the mountains, watched by the world. Here I am with my Spirit broadcast partner, Danielle Malagari. 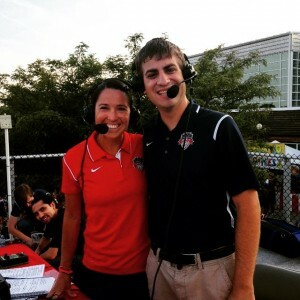 I am the voice of the National Women’s Soccer League’s Washington Spirit as well as an award-winning sports writer, photographer, and designer as sports editor of the Mineral Daily News Tribune and in my current position as multimedia sports writer for the Clarksburg Exponent Telegram. I have a over a decade of play-by-play experience in college and professional soccer and I am always looking for freelance work! Contact me at michael.d.minnich (at)gmail.com to make your match come to life!